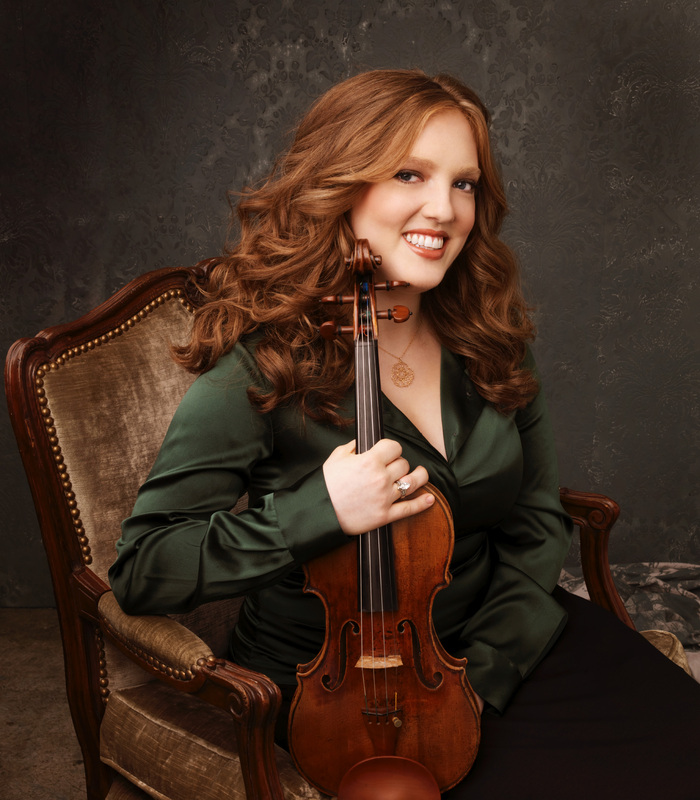 The resume of Rachel Barton Pine boasts some of the most astonishing achievements by any musician in the world today. She began playing at the age of three and a half, debuted with the Chicago String Ensemble at 7, and with the Chicago Symphony at age 10. At 17, she became the youngest (and the first American) to win the J.S. Bach International Competition in Leipzig, Germany. In her adult life, she has started two charitable organizations, The Rachel Elizabeth Barton Foundation and Global Heart Strings. And in 2006, after being nominated by Chicago Mayor Richard M. Daley, she received the Studs Terkel Humanities Service Award. All of this only scratches the surface of this amazing woman’s life and career. If I took the space to tell you about things like carrying the Olympic torch or playing onstage with Plant & Page, we would never get to the interview. In January 1995, Pine was severely injured as she was exiting a train and the strap to her violin case got caught in a closing door. She was dragged 366 feet before being pulled under the train and run over, severing one leg and leaving the other severely mangled. And, although this highly publicized accident brought her name into the homes of many Americans, it would never cast a shadow over the accomplishments she had already achieved with her instrument. Instead, Pine would show her determination and perserverance and prove that her spirit as a person was as strong as her musical talent. Being from the same north side neighborhood in Chicago, I was familiar with the name Rachel Barton for many years. She was considered a local hero by many of the heavy metal crowd because of her outspoken love for the genre and her adaptations of some of its classic songs. Having been known as simply Rachel Barton for so long, the addition of “Pine” was initially uncomfortable for many, most notably, Barton's publicist. She admits that many Facebook users have resorted to simply referring to her by her initials, RBP. And from what she tells me, she's having some fun with it. "I told my graphic designers, I want a rock logo that looks like it could be a tattoo. And someday, I'll know if I’ve really made it if somebody puts my logo on their body. I would give them free tickets to my concerts for the rest of their life." So, as I made my way through Chicago’s rush hour traffic to the WFMT studios to meet with Pine, I felt like I was preparing to meet a rock and roll warrior instead of a prim and proper classical artist. And, once I arrived at the WFMT offices, I came to find out that I was going to be her fifteenth interview of the day. Despite the hectic schedule and her hours of questioning up until the point of our interview, she came into the studio smiling, refreshed, and prepared to answer whatever I had. With this kind of positive, hard-working spirit and attitude radiating through the room, I knew we were going to have a wonderful session. And, as I listen to her latest release, “Beethoven & Clement Violin Concertos,” recorded with the London Philharmonic Orchestra, I am reminded once again of how Pine is bridging the gap between metal and classical. Some might say that this is a gap that cannot, or should not, be bridged; but I’m telling you that construction has already begun, and Rachel Barton Pine is the forewoman on the job. To hear the entire unedited interview as it happened on October 29, 2008, click on the link below! Dr. Music: Okay, I have to get the important stuff out. This is something I’ve always wanted to ask you. I know you’re a huge fan of classic rock and metal music as well as classical. DM: Playing with so many classical artists, have you found any other players that have the same appreciation for rock and metal? RBP: "Well, I did go to a Sepultura concert with a bassoon player once. So, every once in a while it happens. But, you know, my classical colleagues have all kinds of different listening tastes. Some are into jazz, some are into world music of different kinds, some love pop, classic rock -- everybody's got their own tastes. One thing I have found, though, is that a lot of my fellow headbangers are closet classical fans. And that, sort of, me being out there saying, ‘Hey, I love both kinds of music, and it's okay to love both kinds of music, and for those who haven't yet discovered classical that it's possible,’ and all of that kind of stuff; I've gotten people writing to me saying, ‘Hey, I've been a big metal fan for many years, and I also love classical but I was afraid to admit it. But, now that I know you're out there, I'm going to come out of the closet. That's been pretty cool." DM: I think it’s safe to call you a risk taker when it comes to picking music to record; coupling Joachim and Brahms, doing the metal covers on “Storming the Citadel,” and now Clement's D major violin concerto. What is the most rewarding musical risk you’ve ever taken? DM: Do you see yourself making original music, other than the cadenzas? Do you see yourself writing your own pieces? DM: We're all looking forward to it! RBP: “But, I have written many of my own arrangements and encore pieces. For example, I just premiered my latest composition in Iceland only a few weeks ago, which was theme and variations on a popular children's tune from that country. So, I'm definitely doing some composing, and I find that to be rewarding in its own way, very different than interpreting works by other composers from the past or present. But I find that it's all part of an organic whole of being a musician that somehow the creativity that it takes to come up with your own music, then when you go and play somebody else's piece, that creative part of your brain is just that much more active and you’re able to bring, perhaps, more insights into your interpretations than you would if you weren’t exploring music from the other side of the aisle." DM: As you researched Joachim’s essay in preparation of your performance of the Brahms concerto, and were driven by his poetic and colorful descriptions, did you find Beethoven’s documented admiration of Clement to be equally inspirational? DM: I wanted to ask you about the recording process. I’ve seen rock albums recorded, and you can track everything, go back and re-do a solo if you like, and things like that. When doing a long classical piece like the violin concertos, do you ever stop in the middle? DM: Most definitely. And, you know, it's something that's not talked about a whole lot. It really is interesting, the differences. DM: What’s the worst part about the music business? RBP: "Um….gosh…..well, I try to have a positive attitude, but certainly there’s a lot of just always coming up against the unknown. As a concert artist, I can be pretty confident that I'm going to have a certain minimum number of invitations each season, but I never know exactly where I'm going to go or what month I'm going to be busy or less busy. I mean my schedule; I always know it far in advance. Right now I'm booking for spring of 2010, but I have no idea what I'll be doing in spring of 2011. So, it's a weird kind of job that I know exactly where I'm going to be at 3 p.m. on April 16 of 2010, that's odd -- but it's also odd that I have no idea if I'm going to have any work at all in April of 2011. I assume I will, but you never know." DM: You’ve done so much with your life so far, in both musical and humanitarian ways. You’ve carried the Olympic torch, played with Plant & Page, established incredible charities like Global Heart Strings, the Rachel Elizabeth Barton Foundation – the list goes on and on. What has been the most memorable event in your life? RBP: "How can you choose among all these great orchestras? I just love at all. I always say that my favorite concert or my favorite concerto is whatever I'm doing that night. And that's not just a platitude, I mean, that's really the way I feel. Every night when I go out on stage, that's the concert I've been working my whole life towards being able to do the best job I can in that moment, and the next week it’s all about the next concert. But, definitely, jamming with Plant & Page was pretty cool." DM: What is left for Rachel Barton Pine to accomplish? What are your goals for the future? RBP: "Oh, there's so much work yet to be done. I guess, in a way, more of the same -- the same kinds of things that I've already begun doing with my different charitable projects; helping young artists; serving on the board of various charitable and musical institutions; of course, exploring repertoire; continuing my relationships with all of the great concertos and other famous masterpieces for the instrument, as well as digging up more obscure pieces that deserve to be better known; and playing music from various countries around the world. I’ll, in February, be going to St. Louis to play art music by composers from the African continent, which is really a new horizon for classical music. I think Africa is where we’re going to see a lot of new, exciting composing going on. There already is stuff that people just haven't discovered yet. There's more to be done with the electric violin ….more of my own compositions to write. There’s no such thing as retiring, you know what I mean. If I eventually become too decrepit to be able to play anymore when I'm in my 80s, then I'll just keep teaching until I'm in my 90s. Till the day I die. I'll definitely never get bored, that's for sure." DM: If you could work with any artist alive today, who would it be? DM: I have chills thinking about it. Allison Ravenscroft for deciding to call and pass my name along. Max Horowitz at Crossover Media, for taking the time to get some fine arrangements for me in a day that has to be in the record books! It was a real pleasure working with your sheer professionalism. Nobody does it better. Don Mueller and the rest of the WFMT staff for their amazing hospitality. And Extra Special Thanks to Rachel Barton Pine for sharing her thoughts as well as her wonderful spirit with me. It was an honor and a privilege to be in your presence.